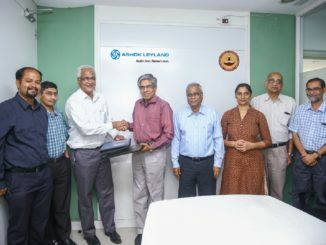 Chennai, February 1, 2018: Ashok Leyland, flagship of the Hinduja Group, reported revenues of Rs. 7,113.16 Cr in Q3 FY 2017-18, against Rs. 4,516.29 Cr (excluding excise duty) during the same period last year, an increase of 58%. The export volumes grew by 46% in the quarter. The company achieved 11.1% EBITDA in Q3 and has registered a double-digit EBITDA in 11 out of the past 12 quarters. Export volumes increased by 46 % to 4289 numbers. Net profit stood at Rs. 449.71 Cr, against Rs. 161.72 Cr, same period last year, up by 178%. Revenue increased by 30% to Rs. 17397.84 Cr as against Rs. 13400.77 Cr (excluding excise duty), same period last year. Net profit stood at Rs. 895.20 Cr as against Rs. 746.91 Cr, same period last year. Ashok Leyland received the Global Marketing Excellence award in the Commercial Vehicle space, awarded by CMO Asia. Mr. Gopal Mahadevan, CFO, Ashok Leyland Ltd., added, “This has been another quarter of consistent performance from Ashok Leyland. The thrust to introduce new products, expand network, connect with customers and deliver superior solutions should help us pursue profitable growth. Our working capital position continues to be very healthy and our focus on cost would continue”.